In preparation for an increase in staff numbers at the Allianz UK Head Office to over 1,000, Space Catering were asked to prepare designs to improve the already very busy in-house restaurant. The brief was to produce a modern and inviting restaurant that would encourage staff interaction and provide their visitors with a high quality corporate dining experience. Over recent years the Space Team have managed several head office restaurant design projects for a number of UK businesses looking to optimise their space for employees. Space worked closely with the Head Office Facilities and Catering teams at Allianz to create an area that would not only cope with over 150 staff and visitors dining at any one time but would also be used throughout the day for adhoc meetings and informal get togethers. This included designing and building a new Coffee Shop and Deli bar and transforming an old conservatory Café, prone to long queues and drainage problems, into a vibrant eating and meeting space with an attractive food offering that included wraps, sandwiches and paninis made to order, grab and go salads, premium bean to cup coffee, as well as a range of hot and cold snacks. The Design Team at Space developed extensive drawings, visuals and walk-through’s to present to Allianz and the contract caterers, CH&Co. 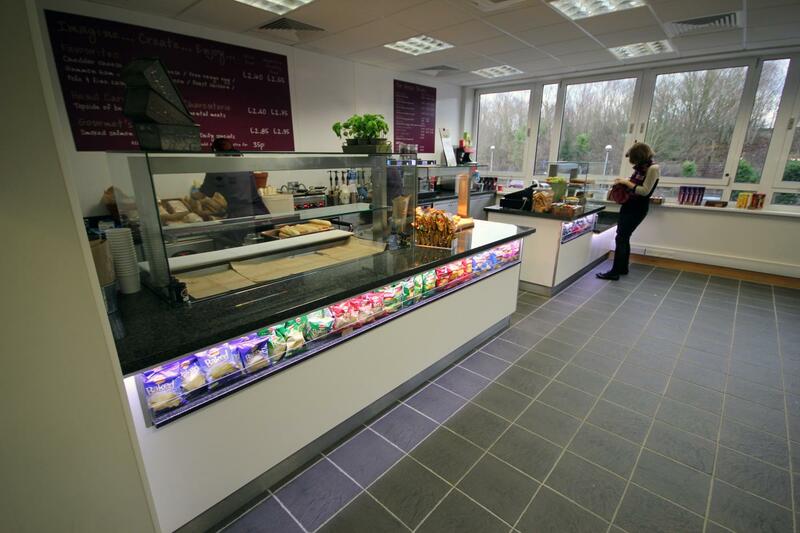 Because the site is so busy the new deli and coffee bar was installed first, using bespoke front and back bar counters with high quality finishes, black granite tops and LED uplighting. Existing equipment was reused wherever possible to minimise costs. A few weeks later, Space installed the furniture for the main dining area and the conservatory using a mix of functional and contemporary dining chairs, tables and eating shelves, as well as more casual circular seating booths. Restrictions vary between projects and with head office kitchen and restaurant designs within fully operating businesses this was no different. All deliveries had to be made out of office hours and parking was limited, in addition, noise restrictions were in place during working hours because business meetings were being conducted in the neighbouring meeting rooms.